McClain’s Kelli Uhrig attempts to drive against at Washington defender on Monday at Washington High School where the Lady Tigers were looking to play spoiler to the Lady Blue Lions chances at an outright FAC title. 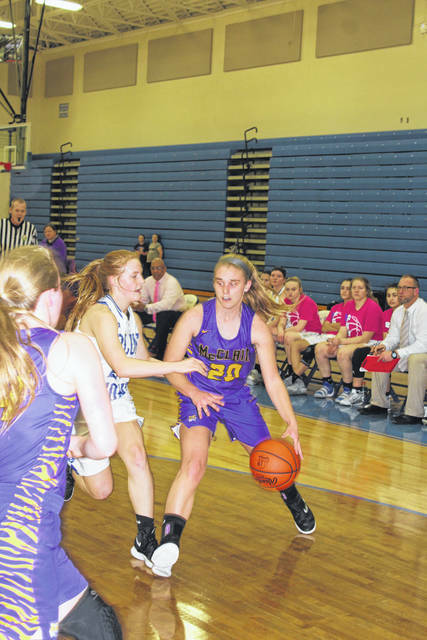 The McClain Lady Tigers were looking to secure a share of the Frontier Athletic Conference championship as they finished regular season play with a road game against the Washington Lady Blue Lions on a rainy Monday night in Fayette County. After a somewhat slow beginning, Washington was the team that secured the FAC title with a 50-32 victory. Senior Hannah Haithcock led the game in scoring with 16 points for Washington. McClain again was able to cut the deficit to five at 25-20, but by the end of the quarter, Washington had its biggest lead to that point, 37-23. “We worked hard,” Haines said. “We did everything we could. They’re long, athletic and they gave us problems with the pressure. “Good for them,” Haines said of the Lady Lions clinching the out-right FAC title. “They have some really good athletes, some really good basketball players. They have a line-up that’s tough to match up with. That senior class plays extremely hard. They do some really good things — they’re smart. Hats off to Court House, they do have a really good team.